Puppy love personalised cotton tea towel embroidered with a name or little message or mongrammed initials to make a truly special gift. 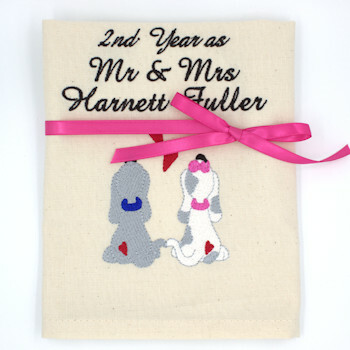 Puppy love personalised cotton tea towel embroidered with a name or little message or mongrammed initials to make a truly special gift. Unique and useful gift idea for men or women ideal for a wedding anniversary! Choose your own Text. Our example reads Happy 2nd Wedding Anniversary however you can have any names or little message you want in place of this! This motif is great for Anniversaries, A Wedding Gift, and holidays like Valentines!